This artist’s impression depicts the newly discovered stellar-mass black hole in the spiral galaxy NGC 300. The black hole has a mass of about twenty times the mass of the Sun and is associated with a Wolf–Rayet star; a star that will become a black hole itself. Astronomers also found that the black hole is stripping matter away from the star as they orbit each other. A newfound black holeleftover from the explosion of a star is the most distant yet to be discoveredby astronomers. The newly discovered black hole, which is about 15 times themass of our sun, is also the second most massive on record. And if that wasn't enough, the black hole is entwined with astar that will also soon become a black hole. Up until now, the only star-mass black holesknown to astronomers were found within the confines of our local cluster ofnearby galaxies, the Local Group. These black holes weigh in at up to 10 timesthe mass of the sun. The newfound black hole is leaving theserecords in the dust. 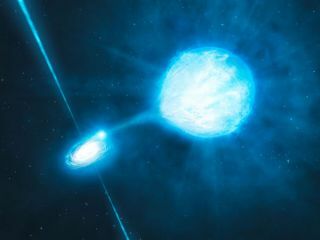 "This is the most distant stellar-massblack hole ever weighed, and it's the first one we've seen outside our owngalactic neighborhood, the Local Group," said astronomer Paul Crowther ofthe University of Sheffield, one of the researchers who made the discovery. Stellar-mass black holes are the finalremnants of very massive stars. They are much smaller than so-called supermassive blackholes,which are found at the center of most galaxies and can reach up to a billiontimes the mass of the sun. The new black hole was spotted in the spiralgalaxy NGC 300 ? some 6 million light-years from Earth ? with the EuropeanSouthern Observatory's Very Large Telescope (VLT) in Chile. X-ray measurements made in 2007 with NASA'sSwift observatory first hinted at the possible existence of the black holethere as they probed the region around the galaxy's brightest X-ray source. "We recorded periodic, extremely intenseX-ray emissions, a clue that a black hole might be lurking in the area,"said team member Stefania Carpano with the European Space Agency. The new VLT observations confirmed thescientists' suspicions and showed that there was indeed a black hole, and thatit had an odd stellar companion locked with it in a gravitational dance. The companion is a type of star known as aWolf-Rayet star, massive stars near the end oftheir lives that expel most of their outer layers into their surroundingsbefore they explode as supernovas and their cores implode to form black holes. The ESO team found that the black hole andWolf-Rayet star (which has a mass about 20 times that of our sun), orbit eachother once every 32 hours. As they circle, the black hole siphons off matterfrom the companion star. But how the two wound up in such a uniquecosmic embrace isn't known. "This is indeed a very 'intimate' couple,"said team member Robin Barnard. "How such a tightly bound system has beenformed is still a mystery." Only one other system of this type has beenseen before, but other systems that feature a black hole with a companion starare not uncommon. Such systems show a connection between black hole mass andthe chemistry of galaxies. "We have noticed that the most massiveblack holes tend to be found in smaller galaxies that contain less 'heavy'chemical elements," Crowther said. "Bigger galaxies that are richerin heavy elements, such as the Milky Way, only succeed in producing black holeswith smaller masses." Astronomers think that a higher concentrationof heavy elements influences how massive stars evolve and cause them to shedmore matter as they age, which makes for a smaller black hole when the remnantof the star finally implodes. The newfound black hole's companion will gosupernova, basically explode, in less than a million years, ultimatelycollapsing into a black hole itself. That eventual explosion could cause thetwo black holes to get closer ? much closer. "If the system survives this secondexplosion, the two black holes will merge, emitting copious amounts of energyin the form of gravitational waves as they combine," Crowther said. That merger would take several billion yearsthough, so astronomers won't be able to watch it happen. But other such systemscould exist and could be detected by that signature of gravitational waves,Crowther said. The finding is detailed in the journalMonthly Notices of the Royal Astronomical Society.